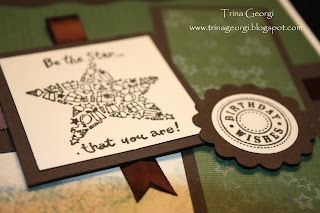 Paper & Ink Therapy: Mojo Monday 126 - Be the Star that you are! I've been totally into this color combo lately...chocolate brown & forest green...it's so rich looking. 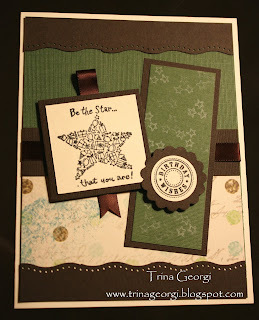 It's also a great color combo when making a masculine card, which is not always the easiest thing to do. Isn't that star stamp cute?! Did you notice all the little graphics within the star? I also incorporated more stars in the panel next to it by stamping the forest green cardstock with a cluster of little stars, in Tsukineko's Sage. Hopefully, the person getting this card won't check out this blog before he gets it. Here's a closer look...I popped up the two graphics to give it a little more dimension. That's it for now...have a good rest of the weekend. 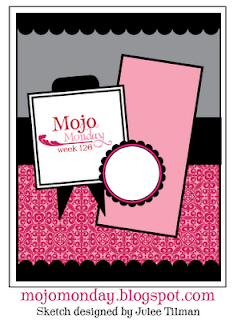 Card Recipe: Mojo Monday 126 - Be the Star that you are!